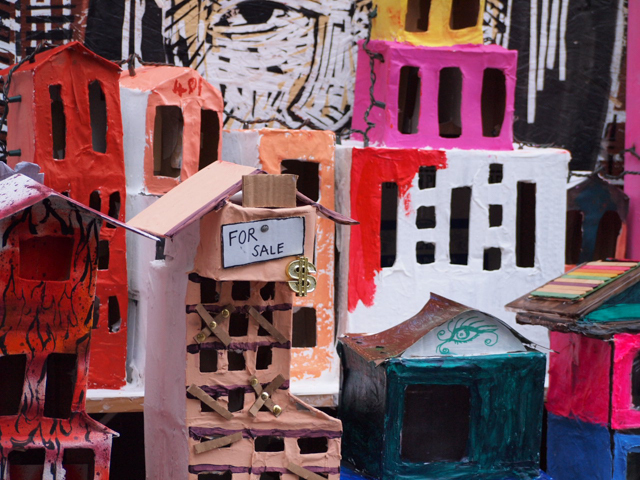 Residents collaborated to complete their sculptural representation of the Mission. 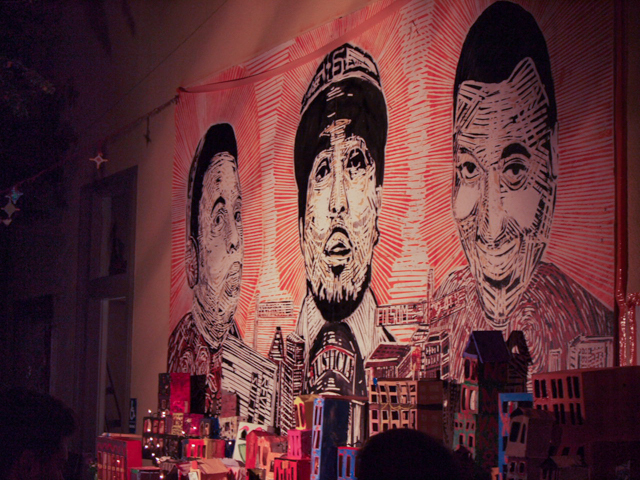 The Mission’s housing crisis was on center stage at the Red Poppy Art House on Saturday evening, and that stage had a hole in it. 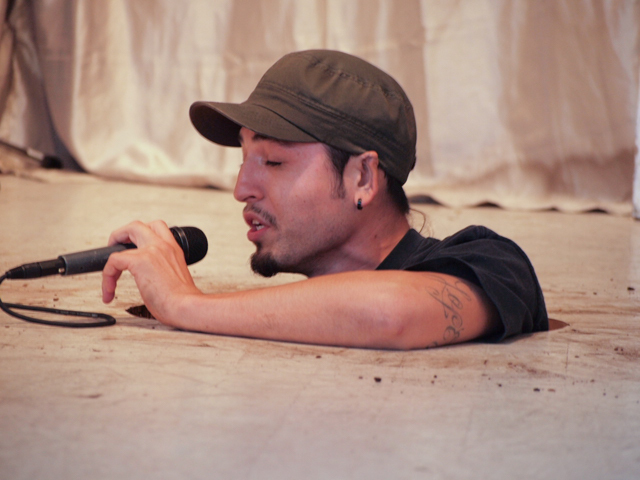 All afternoon and evening, artists convened around, peeked out of and disappeared into the small hole in the art house floor. They explained it symbolized the Mission’s present being built over its past, at the expense of longtime residents who are slipping through the neighborhood’s floorboards. Called “Our Built City,” the event reimagined the neighborhood in performance and as “sculptural housing” designed by artists and neighbors, addressing “tensions between race, class, ownership, authenticity, and cultural expression.” Those sculptures stood outside, on the Red Poppy’s 23rd Street sidewalk — a model neighborhood constructed in recent weeks with the help of local artists, families, and members of the Mission’s homeless population. Caleb Duarte Piñon and Mia Eve Rollow, acting co-artistic directors at the Red Poppy, organized the project as part of the weekend’s Mission Arts and Performance Project (MAPP) festivities. 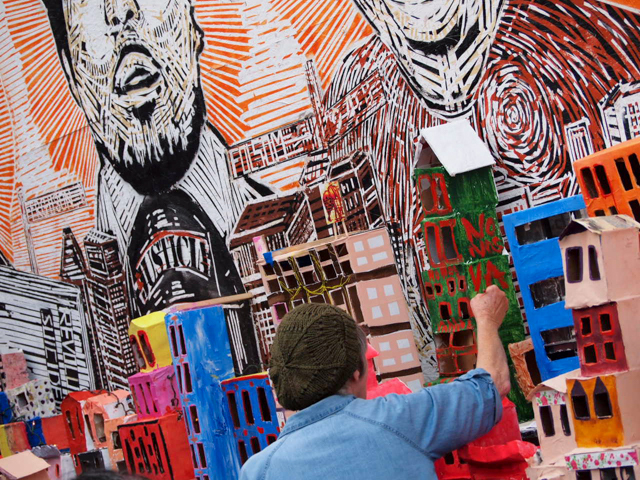 They hoped it would bring neighbors — new and old — together as actors and illustrators demonstrating their perspectives of the neighborhood’s growing pains. The cluster of city apartments sit above a sleeping bag to show living situations in contrast, according to Duarte and Rollow. They added that they hoped people would actually use the sleeping bag — the wall beside the Red Poppy has been a popular spot for those who are homeless to sleep. 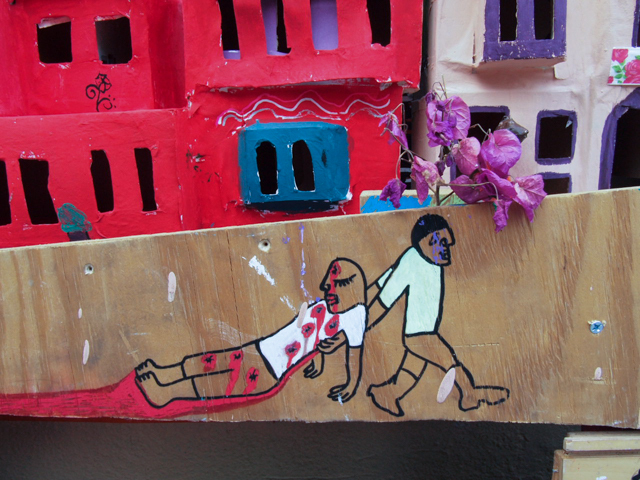 Behind the sidewalk housing sculptures loomed a mural of victims of police shootings, including 28-year-old Alejandro “Alex” Nieto, by the artist Yescka. Below the model homes lay a sleeping bag for the homeless. 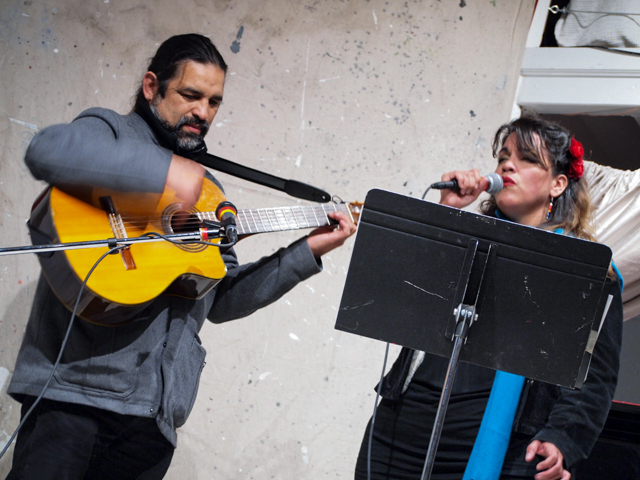 The event was “both personal and social,” Duarte said, because the organizers themselves have been homeless since coming to San Francisco from Chiapas, where they founded their arts project “EDELO” and worked for about half a decade. Duarte, whose bachelor’s degree is from the San Francisco Art Institute, said that during San Francisco’s previous tech boom he lived in a van. Duarte said they tried to keep the colorful housing display “more politically neutral,” but community members snuck some political messages in. Among them were “siempre resiste,” with an uprisen fist. “You think you can’t make a difference?” said pianist and former Mission resident Kristina “K” Soriano. “Try sleeping with a mosquito — you know it’s out there, you can’t sleep. You could be that mosquito!” She began to play Beethoven while artist Ramiro Martinez slowly pivoted in the hole in the floor, gazing skyward, the fringe of his poncho dragging through sprinkles of dirt. 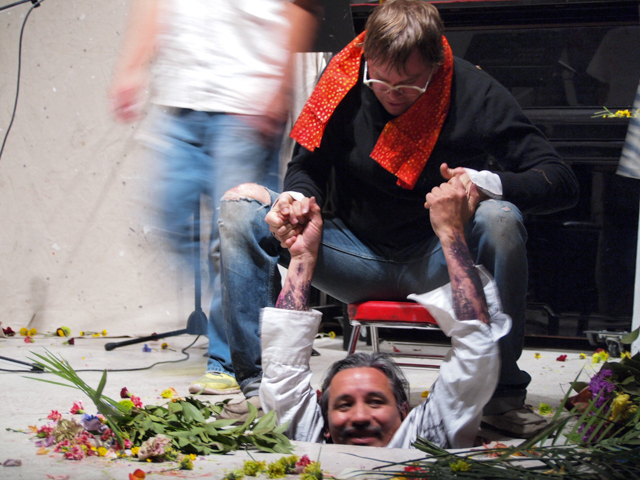 Todd Brown, founder of Red Poppy, pulls visual poet Adrián Arias from the hole in the art house floor. The two then collapsed in a heap, ending the night’s festivities. Earlier, Arias performed a piece he said was about eviction, called “Exile,” where others painted him white, pink and black to classical music. 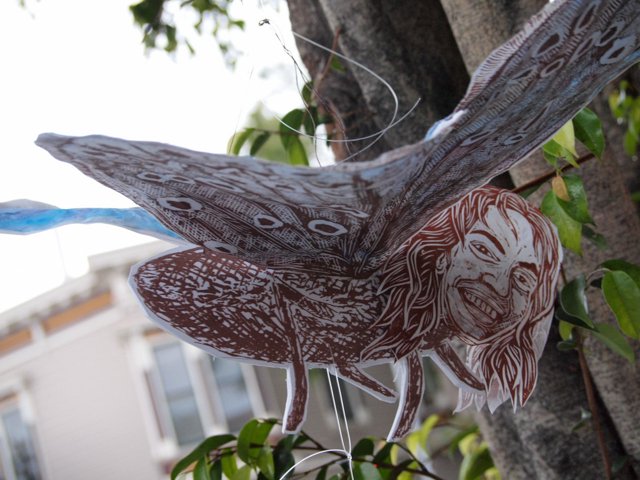 He lived in the Mission himself for about nine years, but recently moved to Oakland. “Oakland is the new Mission,” he said. Most feedback was simply of the supportive, picture-snapping variety, the co-directors said. But there were a couple notable encounters. One was with a woman who identified herself as a gentrifier, seeking advice in dealing with local perspectives that left her feeling alienated. The most disruptive involved a neighbor who threatened to call the police about the sidewalk display. But the greatest challenge faced by the organizers was finding a home for their project — and for themselves. Though small, the Red Poppy was able to accommodate the artists faster than larger art institutions, which can take the better part of a year to process grants, Duarte said. The art house at 23rd and Folsom is facing hardship itself, operating on “a thread” according to founder Todd Brown. It has grants from the Hewlett Foundation and San Francisco Grants for the Arts, but was recently declined an SF Arts Commission grant. Despite content that has fueled many a debate about the Mission’s identity, the event this weekend lacked contention. Inside and outside of the Red Poppy, countless neighbors and tourists from as far away as Russia sat on couches and window seats to observe the art and chat. 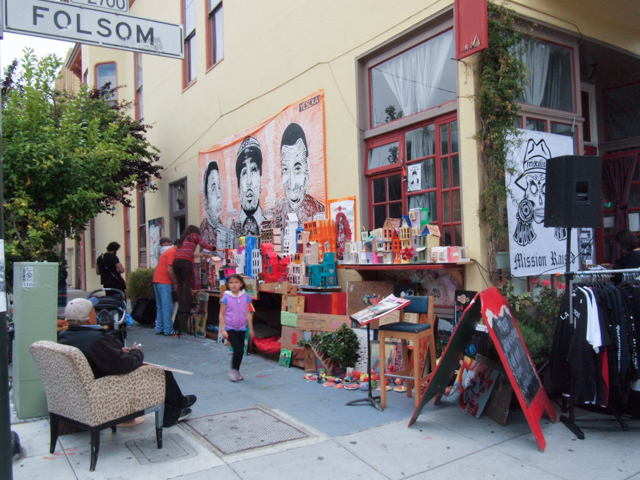 The Folsom Street sidewalk emulated a jolly living room as MAPP attendees — largely young couples and friends — passed through, eating ice cream and sipping coffees, while artists mingled post-performances. 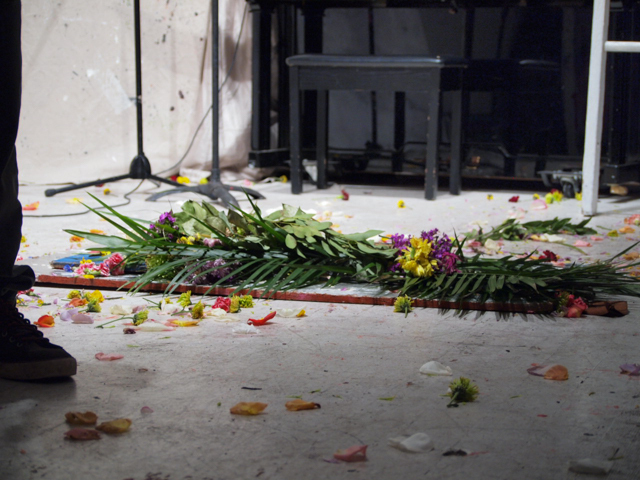 The hole in the art house floor, covered by a plank and flowers at the end of the event. One guest did accidentally fall in the hole during the event, just after 7 p.m., bumping her knee. She had been headed to the piano with sheet music. Little discussion amongst visitors addressed the displacement illuminated in artists’ work, but occasionally someone would expound upon the topic at hand. The Mission wasn’t always Latino, it was said, but it was working class. 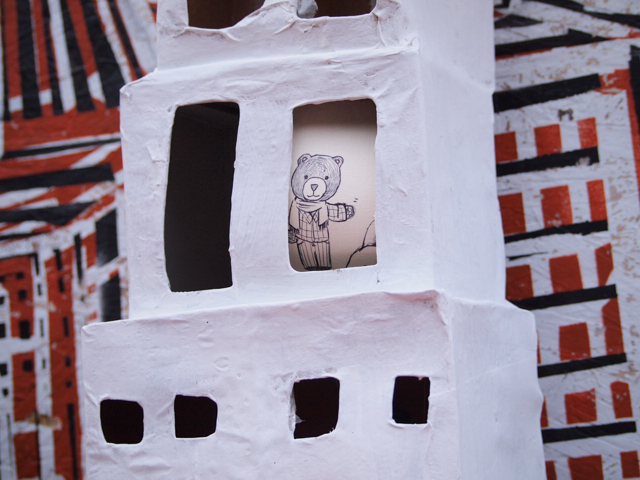 Around the corner from the living room, residents cheerfully collaborated to finish the housing sculptures with their kids. Felicia paints, courtesy of her aunt Rachel, who read about the art project on the site “Funcheap.” (Participating was free.) 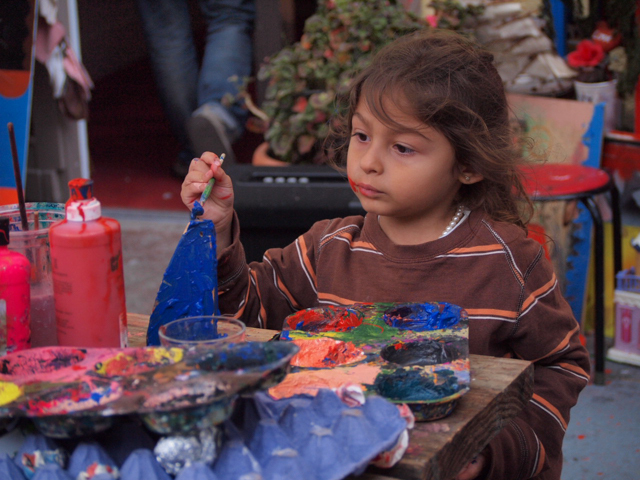 The organizers said they often had more than 10 local kids painting daily before the event. J.J. Barrow began reporting for Mission Local in 2010. She once rode the 49 Van Ness-Mission for six hours straight while the rest of the city tuned in to the World Series — until revelry ended the route. She misses hiding in Guerrero's quiet Cafe Petra (now defunct) to write.